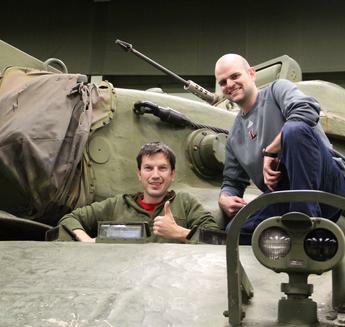 AAF Tank Museum's "Behind the Ropes"
We offer a couple specials that our guests can schedule and take advantage of. They are listed below with a little information about each. If you are interested in scheduling or finding out pricing please email Natasha at tankmuseum@gamewood.net or call her at 434-836-5323 and she will be happy to help. We offer the option to get a ride inside one of our vehicles on a day that the museum is open to the public. This is for laps inside the museum building, so weather is not an issue. This must be scheduled for in advance. We also require payment upfront as well. It can NOT be done on an event Saturday. We offer the option to have the museum opened any non-regular business day. This would have to scheduled in advance and payment is due when scheduling. We offer the option to climb on and inside tanks!!!! WHAT?!!! This is scheduled in advance and paid for at time of scheduling. It is by the hour and you get 4 tanks per hour.